We’ve updated the developerWorks/social page. This landing page contains links to key resources for social business application developers, including several community resources like StackOverflow, GitHub and Collaboration Today. 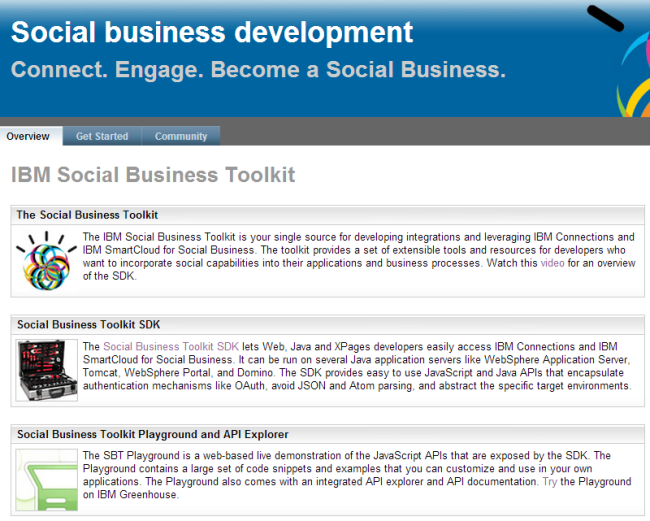 There is also getting started information explaining different types of developers how to start using the IBM Social Business Toolkit. The page can be reached via the short URL developer.ibm.com/social. We have updated and restructured the content, but haven’t touched the style. Stay tuned for more improvements in this area. Thanks to my colleagues Michael Stewart and Craig Lordan for making this happen.